Non-profit organisation KaBOOM! has launched a campaign to locate 100,000 play spaces (playgrounds, skate parks and field complexes), in 100 days. The campaign is designed to promote the idea that every child should have a play space within walking distance of their home. You can enter a new play space, or search for a play space already entered, via KaBOOM! 's Google Maps mashup. For each valid new entry Mercury Nashville recording artist Julianne Hough will donate $1 to your cause and enter you for a weekly prize draw. All the play spaces already mapped have been rated. The map markers indicate the number of stars that the play space has been given. 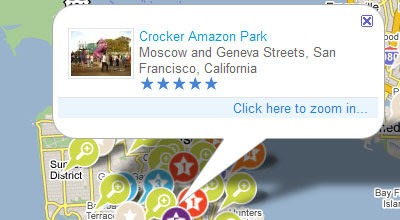 Clicking on the marker opens an information window showing the address of the play space. Thank you so much for helping to spread the word! We linked back to your post here.